Welcome everyone to our Layers of Color New Release Party and Blog Hop!!! Today we're revealing our new Christmas Collection designed by Laura Kirste Campbell and Nina Brackett! These special designs were created from the artist's hearts in celebration of Christ's birth. In our new Christmas Collection we are offering Spellbinders die coordinating stamps, images for Christmas cards, quick 'n easy gift tags, and timeless card verses. There are lovely classic designs that are wonderful beyond the Christmas season too! 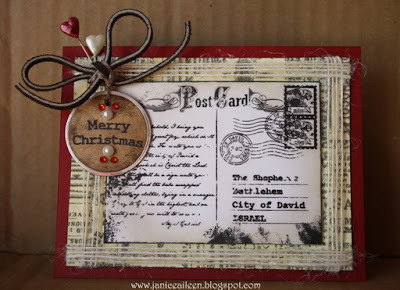 This card uses the new "Vintage Postcard" cling art stamp as the main focal point, and the new "Sentimental Banners" clear art stamp set for the Merry Christmas greeting. I simply stamped the postcard image on white card stock then inked around the edges in "Memento Desert Sand" to give it that aged look. 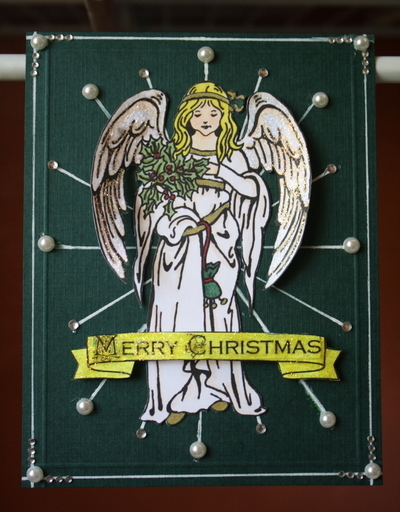 Now onto a card showcasing the new "Holly Angel" cling art stamp. I will be drawing a name from all my commenters from today's hop and will be giving this stamp away for FREE! So make sure you post a comment for your chance to win! "Sentiment Banners" and "Christmas Verses" clear art stamp sets were used to make the banner. Before you enjoy viewing the entire Layers of Color Christmas Collection, first enter the Grand Prize Drawing where you have the chance of winning all seven new release art stamps! To enter, simply "like" Layers of Color Art Stamps on Facebook and comment on this blog post. It's that easy! (You may want to bring your friends too because as soon as we reach 300 on our new Facebook page, we're having another drawing!) The winner will be announced on Layers of Color blog and on Facebook tomorrow, September 20th. AND, since you love fresh, new ideas and inspiration for your stamping projects, you'll want to visit our designer art galleries that have been recently updated with the talented Layers of Color design team's newest projects! Now, hop on over to the rest of their blogs for more Layers of Color Christmas Collection creations and GIVEAWAYS! Janice these are stunning cards - like you, I love the angel on the dark green. I must head over to LOC to see the full release! I too love the angel on the dark colour and the whole card in fact. I love your take on the angel using the traditional colours. How clever! The cards are beautiful and inspirational so I'm heading to the next blog to see more. Hi Janice, I am loving this bloghop! I've never participated in one before. I love the cards you have made. Gorgeous! Wow! All of your cards are stunning...I especially like the Vintage Post Card one! I really LOVE all of the new stamps, they're FABULOUS! Good luck on your big move...I bet Portugal is GORGEOUS! Janice your samples are BEAUTIFUL! 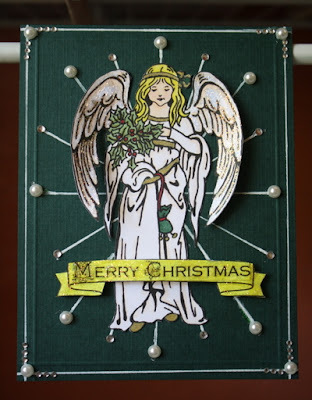 I love the Holly Angel with the red/green colors...wow! Janice all the cards are gorgeous. How did you do the pow on the postcard? And I am in love with the ngel and pearls. Thanks so much for the chance at the win. Oh my Janice... you really went all out with these!!! Incredible details, especially on the last one! Just beautiful and I am praying for your move, and praising God for His provisions for you all! Can't wait to hear all He'll do through you all!!! Janice, these were simply gorgeous creations. I love all the wonderful details. I like how you made the postcard the focal point on the first card. I liked seeing the angel with the green wings. I never would have thought to color them green. I absolutely love the one with the pearls. I would really love to win these stamps, they are awsome. Gorgeous cards. Wonderful details and colors. TFS YOUR TALENT. I love the angel stamp...I just think she is beautiful. Have a safe move and enjoy your blog break..look forward to your return. These cards are stunning! I really like the one with the Vintage postcard! How beautiful!!! You've really done a wonderful job, thanks for taking the time to share these wonderful cards with us. The Christmas verses set that you used is wonderful! Beautiful cards Janice! I especially love the white angel on green!!! Blessings to you! Fabulous cards!! I especially LOVE the card with the pearls!! SO very gorgeous! Love that bejeweled tag and the subtle twining in the corner of the first card. . .both are just lovely! Have a blessed day! Glorious cards, Janice! My favorite would have to be the angele with pearls -- absolutely gorgeous! Your cards are stunning! Love them! Amazing cards! I love the pearls around the angel. Your artwork is beautiful! I just love this angel; so elegant but doesn't look overwhelming to color. TFS! Beautiful, absolutely beautiful. I'm really like the new sets. Janice, these are great! I really like the fact that you showed the angel done in different ways. Lovely job on all of these. These are all lovely Janice!! And the dark green wings are so creative! LOVE that you thought to do somethind different! And the cross center with the rose in the middle ... fabulous idea girl! Hi, Janice! What an exciting adventure to move to Portugal! I have never even been overseas so it's hard for me to imagine moving that far away from home but it sounds really exciting. Your cards are just beautiful and the new stamps are fabulous... right up my alley, as I always make very traditional Christmas cards. Thanks for sharing your wonderful talent and good luck with the move. Janice, all beautiful cards. You always add the neatest little touches to your cards... 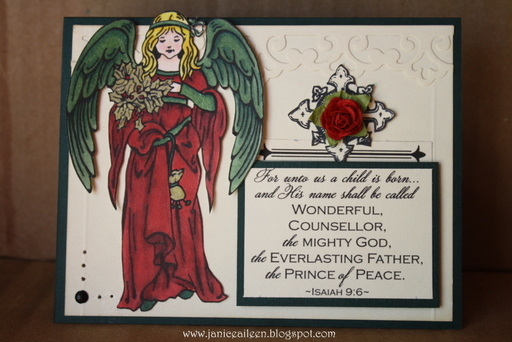 I love how you thought to incorporate the "Gothic Crosses" on the 2nd card and the richly colored angel is beautiful! Now my favorite... the white angel...she absolutely heavenly! that angel is beautiful... same stamp and 2 very different cards. Love them both. These new stamps are wonderful and the cards you made using them created a bit of stamp envy!!! Hope I can win them! Pure loveliness, Janice. I love them all. Thank you! Wonderful cards! You have a very unique style. REALLY love the postcard creation - absolutely fabulous! They are BOTH wonderful cards!! I like the colored one, but the one in white and the shining auror around here is beautiful. But then I really like the verse on the red one! So YES. BOTH are beautiful! YOUR CARDS ARE BEAUTIFUL, I TOO LUV THE DARK GREEN ONE.